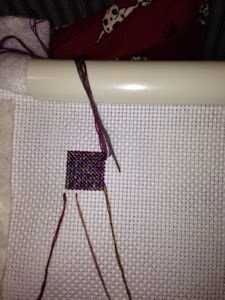 As tired as I was I was determined to start my second new project for the year. It is a huge bunch of flowers in a vase and the chart I believe is called Deep Love. This design will be about 23 inches by 28 inches when finished. Tonight I put in 100 stitches. Today Alan and I went into Bunbury. Bunbury is a large town, very small city (so they say) some 65-70 kms fromm here. I travel in twice a week to go and visit my dear mother-in-law who is residing in a nursing home there. We went and visited Beryl for several hours. Today she was unsure of who we were but was never-the-less very happy to see us and even happier that we came with some small cakes for her. She does love cake. We then went and had our eyes tested. Crumbs that is an expensive exercise. Ended up costing us over $700 even with our discounts etc. Anotheer chicken had hatched overnight. Three of the little darlings now.